The following is an amended excerpt from the DBT-CBT Workbook. It is from Chapter 8, “Challenging Extreme Judgments,” which focuses on the negative things we say to ourselves (and believe) and the negative things others have said of us that we come to believe as truths about us. When we’re mad or hurt, we sometimes say very hurtful things to ourselves and others. This is Emotion-Driven Behavior. Our hurtful words are based on how we’re thinking and feeling in the Heat-of-the-Moment! They’re ANGRY WORDS. We’re not in Rational Mind and we’re not speaking truth. We’re expressing HOW WE FEEL about people and things WHEN WE’RE MAD OR HURT! Words driven by a heated Emotional Mind SHOULD NOT BE TRUSTED! THESE TRUTHS SHOW HOW MUCH OF A LIE the negative judgment is…and has been. The judgment was NOT based on truth. It was an EMOTION-DRIVEN LIE MADE UP about us…and WE HAVE LIVED SO MUCH OF OUR LIFE BASED ON THIS LIE. We have believed the lie. We have NOTICED EVERYTHING that supported the lie, and discounted, overlooked, and IGNORED ALL THE THINGS that challenged the lie…all the things that prove we’re NOT stupid, worthless, or undesirable. LET THAT SINK IN. What was said about you is A BOLD-FACED LIE. IT IS NOT TRUTH. We know that now because THE FACTS PROVE IT! Anytime those old feelings come up, be ever so Mindful of the facts and the TRUTH. TAKE A STAND and RATIONALLY CHALLENGE THE LIE…right then and there. Don’t EVER let yourself get away with believing that lie again. RATIONALLY CONFRONT IT and DEFEND YOURSELF! The following is the text that follows this worksheet and discussion directly about it. Most of the negative judgments made about us…were first said to us when we were young. They were NOT based on anything about us…not a character trait or a personality feature. When someone tells a 3 or 4 year old child that they’re worthless, stupid, or will never amount to anything…or they’re too much of this or too little of that…or no one will ever love them…IT’S AN EMOTION-DRIVEN LIE. How in the world can someone know something like that about a very young child? This type of meanness, ugliness, and hurtfulness SPEAKS VOLUMES about the person making the statements…AND SAYS NOTHING ABOUT THE CHARACTER OF THE CHILD. We know that when WE make ugly and insulting comments to others, we’re being verbally abusive. Oftentimes, we’re mad and we say these things in anger. Likewise, THE PERSON saying ugly things to us is UPSET, too. Often, THEY FEEL stupid, irresponsible, or worthless and THEY TAKE IT OUT ON US. Most of them were emotionally abused…and are just MINDLESSLY PASSING IT ON to the next generation. Also, they may suffer the moodiness and impulsivity that goes with drugs and alcohol, Bipolar Disorder, Borderline Personality Disorder, etc. For whatever reason, they’re BIG-TIME IN EMOTIONAL MIND and they’re being verbally and emotionally ABUSIVE to us. When we’re YOUNG or VULNERABLE, (22) WE TRUST THEIR OPINIONS and come to BELIEVE what they’re saying. However, WE’RE BELIEVING AN EMOTION-DRIVEN LIE. When we did “The Challenging Negative Judgments About Me Worksheet,” we CHALLENGED the EMOTION-DRIVEN LIE by looking at the Big Picture of Our Life THROUGH THE EYES AND TRUTH OF RATIONAL MIND. When we review this worksheet and consider all the things about us that support we’re capable people with worth and value, we’re functioning in Rational Mind. When we make a DECISION that WE’LL NO LONGER JUDGE OURSELVES in a FALSE and HURTFUL manner, we’re functioning in WISE MIND. When we’re DETERMINED that ANY TIME those old thoughts or labels COME TO MIND, we’ll CHALLENGE THEM and REMIND OURSELVES of all the things about us that PROVE otherwise, then, we’ll be USING WISE MIND TO MINDFULLY PROTECT OUR PEACE AND STABILITY. ANY TIME, ANY ONE of those NASTY JUDGMENTS comes into our thoughts and begins to hurt us, WE NEED TO CHALLENGE THEM…right then n’ there. (23) We need to STOMP THEM OUT and REFUSE to allow them to CONTROL US any longer. They are lies. WE HAVE BEEN LIVING A LIE. We have perceived ourselves based on a lie. DO NOT ALLOW THESE LIES TO CONTROL YOUR LIFE ANY LONGER! DO NOT ALLOW THEM TO TAKE AWAY your peace and stability! They’re things Coming At Us that have NO PLACE in our Inner Circle. TAKE A STAND against these lies…and FIGHT FOR YOUR RECOVERY! APPLICATION: Stupid Is as Stupid Does? At this point, some folks say, “When they said that, I had done something stupid or irresponsible.” Remember, we’re human. We’re not perfect. Things WILL happen. That’s our humanity! One stupid behavior or 10 or 12 of them means we did one stupid behavior or 10 or 12 of them. Those things describe our behavior in-the-moment or the month. They DO NOT define WHO WE ARE as a person or WHAT WE’RE CAPABLE OF. They DO NOT define our character or our make-up. THEY DEFINE AN event, action, or a behavior…NOT our WHOLE person. Just because the 8th grade educated shift team leader made a mistake, that doesn’t mean he’s stupid. That means HE MADE A MISTAKE…THAT DAY. That mistake and an 8th grade education DOESN’T describe what he’s capable of. Those things DO NOT define his character or describe everything he has ever accomplished in life. HE IS NOT STUPID. He simply made AN ERROR. (24) Stupid ISN’T as stupid does! We’re NOT stupid or clueless. In our gut, we usually know our behavior is going to cause problems BEFORE we do it! We have Wise Mind going on, but we’re NOT PAYING ATTENTION TO IT. We’re NOT Following Through With What We Know is in our best interests…because WE’RE BIG-TIME in Emotional Mind! WE’RE DYSREGULATED… we’re LIVING IN-THE-MOMENT. We’re uncomfortable…we hurt…we’re not worrying about tomorrow. We’re living for TODAY…and if it feels good…we’re going to do it! No, we’re NOT STUPID. We’re ACTING in poor judgment. We KNOW better. We know right from wrong…and good from bad. We DO stupid things because EMOTIONAL MIND IS DRIVING. That’s why we SPIN-OUT and LOSE CONTROL. That’s why we wreck-out and our life becomes a total wreck. and no one or nothing was going to stop us. We were being VERY WILLFUL. What we did was EMOTION-DRIVEN Behavior. We do all types of MINDLESS and IMPULSIVE things when we’re acting on Emotional Mind…ESPECIALLY WHEN WE’RE IN A DESPERATE STATE, like desperate for relief, desperate for comfort, or desperate to be held and loved on. It’s NOT STUPIDITY. It’s DESPERATION. You’ve heard the saying, “Desperate times call for desperate measures.” Well, desperate measures often involve risky things that are likely to have a bad outcome. So, BECAUSE WE’VE DONE SOMETHING STUPID or two years or ten years worth, that DOESN’T MEAN WE ARE STUPID. That’s because WE KNOW BETTER. WE JUST DO IT ANYWAY! Gladly, this workbook is about GETTING CONTROL of our BEHAVIOR and our LIFE! And, we do that by Turning On RATIONAL MIND and WISE MIND to REGULATE and CONTROL our dysregulated and Out-of-Control emotions and Emotion-Driven Behavior. 22- If we’re older when these lies were spoken, they usually came from an abusive spouse or romantic partner. Over time, we’ll realize these people were angry, mean, harsh, moody, and unfair. We KNOW their words were Emotion-Driven. We KNOW they’re abusive, mean, and critical people, but for some reason, we believe their ugly opinions. We believe they’re right and other people are wrong. Go figure. The truth, we were vulnerable and they took advantage of it. Often, they were mean to “keep us in our place”…in a “downed position” with low self-esteem. They wanted us to believe we ARE stupid, unworthy, and not capable…so we would never have the strength to leave them. 23- Whenever a negative judgment begins to bother you, either complete “The Challenging Negative Judgments of Me Worksheet” in your mind or on paper. Use this RECOVERY TOOL to challenge those lies! 24- I’m pretty smart with a Ph.D…that just gives me a license to be Piled Higher and Deeper in errors! Lord knows if it’s 10AM and I haven’t made an error yet, I must still be asleep! 25- Dysregulated – (dis-reg-you-lated) – not in control of ourselves… we’re not able to regulate or control our behavior. No matter how smart we are or how much psychological stuff we know, we can get side-swiped and wrecked-out by a hurtful comment. When we believe these lies and base our sense of self and identity on these lies, we’re viewing ourselves through Emotional Mind. We’re not dealing with the facts and the truth. We’re overlooking, ignoring, and denying all the things which tell us we aren’t that way…and we’re focusing on ALL the things which suggest we may be that way. We’re ignoring what Rational Mind is telling us and we’re viewing ourselves through the distorted lenses of Emotional Mind. We have thought poorly of ourselves and have treated ourselves poorly because of a lie. We ARE going to do some stupid and thoughtless things now and then, but that doesn’t mean we’re a stupid and thoughtless person. It means we DID SOMETHING that was stupid or thoughtless. We ACTED in poor judgment. We went against our good judgment. “Then how do we describe this stupid, poor judgment behavior? !” We describe it as DESPERATE behavior. It’s not an issue of smarts. It’s an issue of being desperate and dysregulated! It’s an issue of being OUT-OF-CONTROL! We know better, but we do desperate, self-defeating things anyway. to make the life changes that will change their lives. GETTING ON and STAYING ON the Recovery Path. Come join us in our journey. This workbook explains why we do the things we do…and why we keep doing these things even though they cause us more pain and problems. It’s about what we do in the heat-of-the-moment…the emotional moment. It’s about what happens when EMOTIONAL MIND drives and RATIONAL MIND takes a backseat…and WISE MIND is left on the side of the road. When we’re filled with upsetting emotions, we often do things for quick relief…like drugs and alcohol; suicide attempts; cutting and other forms of self-mutilation; aggression; temper tantrums; walking off and leaving the situation; withdrawal; overeating or not eating enough; overshopping; “sleeping around”; rebound relationships; gambling; and other risky and reckless behaviors. The Nature of the Problem is…the things we do to feel better end up multiplying and intensifying our problems. Our Destructive Coping Behaviors help us to cope in the Heat-of-the-Moment…but, they have many negative consequences. They make our current problems more severe…and they CREATE many new problems for us to struggle with. Over time, our lives spiral OUT-OF-CONTROL and into a CYCLE OF SUFFERING. This workbook provides useful tools, attitudes, and plans for changing how we respond to life. Our goal is to GET CONTROL of our OUT-OF-CONTROL emotions, behaviors, and thinking. We do this by PARTICIPATING EFFECTIVELY in our lives and by using LIFE-ENHANCING COPING MECHANISMS to deal with our pain and problems. Our goal is to MINDFULLY PROTECT OUR PEACE AND STABILITY and the BIG PICTURE OF OUR LIFE. Our goal is to STOP the CYCLE OF SUFFERING. we might have in each area are also noted. from problems in SOME or ALL of the six areas. Please see the “List of Common Self-Destructive Coping Behaviors” above. and other forms of self-inflicted body damage). How many of these things do you do? Most of us do MANY of these things…and we end up with a lot more problems to deal with! 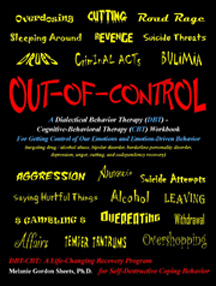 This list is excerpted from the DBT-CBT “Out-of-Control” Therapy Workbook by Melanie Gordon Sheets, Ph.D.
DBT is Dialectical Behavior Therapy and CBT is Cognitive-Behavioral Therapy. The following is “Pete’s Story” – an excerpt from the DBT-CBT Out-of-Control Workbook which highlights a “real life” relapse experience. This relapse is processed using principles and concepts from the DBT-CBT Recovery Program, especially the three mind states of DBT. It’s an example of DBT-CBT “In Action.” The content for this post is the opening for Chapter 7, the “Rational Mind” chapter of the workbook. As it is from Chapter 7, it refers to things discussed in Chapters 1-6. So, if you feel a little lost reading it…that’s why! We’ve been working with Rational Mind (1) throughout this book, so you’re somewhat familiar with this mind state. Rational Mind is the part of us that processes life in a logical, legalistic, fact-driven, reality-oriented, and cut n’ dry manner. In other words, Rational Mind uses reasoning, it respects rules, it’s guided by truth, it deals with how things really are, and it’s the calm, cool, intellectual, and unemotional part of us! Emotional Mind is driven by how WE SEE AND EXPERIENCE the world while Rational Mind is driven by how THE WORLD REALLY IS! A Recovery Goal is PREVENTION of Destructive Emotion-Driven Behavior. We need to STOP OURSELVES before we do what we really feel like doing! Rational Mind helps us to gain control before things get Out-of-Control. When we’re in a troubling Emotional Mind state, the first step for gaining control is Mindfulness. We need to be aware of what’s going on in Emotional Mind. We need to be Mindful of our Raw Emotions, Emotion-Driven Thoughts, and our desired Emotion-Driven Behavior. This includes awareness of our feelings, the thoughts racing through our mind, and what we’re thinking about doing! Once we become aware of what’s going on in Emotional Mind, we need to TURN ON RATIONAL MIND to look at our situation logically and realistically. Rational Mind helps us to know what is true and factual. It helps us to perceive the reality of our situations and our life. The reality of Rational Mind is generally quite different from the picture Emotional Mind paints! Rational Mind helps us to understand THE BIG PICTURE OF THE SITUATION and the TRUTH about what’s going on. This helps us to challenge our Emotion-Driven Thoughts and to get our emotions MORE IN LINE with the REALITY of the situation. This REDUCES our emotional distress because we FOCUS on the HERE-AND-NOW situation RATHER THAN EVERYTHING that has EVER HAPPENED to us. Rational Mind also considers the Big Picture of Our Life and REMINDS us of the CONSEQUENCES we’ll SUFFER if we ACT ON destructive Emotion-Driven impulses. WHEN we’re USING Rational Mind to deal with what’s going on in Emotional Mind, WISE MIND TURNS ON and BRINGS US to a GAME PLAN for effectively dealing with our situation. Our Recovery Goal is to PARTICIPATE EFFECTIVELY in our life… so we’re MANAGING and DEALING WITH our problems RATHER THAN CAUSING OURSELVES MORE PROBLEMS! The following story, “Pete’s Story,” is a good example of how the three Mind States work together in real life. Pete has a lot of stress and family conflict caused by his responses to life. His family has allowed him to stay in their garage apartment “for the last time.” His probation requires him to be employed. He doesn’t have a good work history so it took a while to find a job. He just bought a used car and now has visitation with his kids because he’s paying child support. Things are pretty good in his life… though not the greatest. His boss accused him of doing something he didn’t do. He blew up and walked off the job. He went to an old hangout and started drinking again and snorted some coke. Thoughts began churning in his mind. He is very worried and is thinking the worst, “My family is going to kick me out and I’ll be homeless again. I’ll lose my car without income and I’ll lose visits with my kids. If I get called for a UA (2), it’ll be dirty and my probation will get revoked (3)…especially since I’m now unemployed. Then I won’t see my kids for a long time.” He’s very upset with himself and thinks, “I am such a failure. I screw everything up. My family will NEVER let me hear the end of this. I should just kill myself. I can’t handle all this crap again.” Thoughts are racing through his mind. His emotions intensify and he becomes more and more upset. He begins to panic. He is desperate for a way out and considers going back to live with his ex-girlfriend. He’s afraid of doing that because she still uses drugs. He panics even more and all he can think about is killing himself. He ruminates about this stuff for hours and hours. It’s now 3AM and he’s worried about going home…so late…so upset…and so messed up. The quality of our life comes down to two choices. to get a Game Plan for dealing with our problems. or to go the way of Relapse Route. Re-read Pete’s story and UNDERLINE the parts that describe what’s going on in his Emotional Mind. Put a BOX around the parts that are driven by Rational Mind. You probably had no trouble identifying what was going on in Emotional Mind. You may have had some trouble deciding if his statements about getting kicked out of his apartment, being homeless…and losing his car, probation, and visits with his kids were Rational Mind or Emotional Mind. When he went to the bar, he was upset. then he became hopeless, desperate, and PANICKED. Mindfulness of the consequences suggests he was in Rational Mind. Some think he was in Emotional Mind because it seemed like he was catastrophizing4 how bad things could get. However, given his life situation, his worries WERE based on truth and reality! A reason to suspect he was Big-Time in Emotional Mind is…WISE MIND DIDN’T TURN ON and OFFER LIFE-ENHANCING SOLUTIONS. All he did was ruminate for hours about consequences and finding a way out…NOT A WAY THROUGH. He was panicking! All the COCAINE and ALCOHOL did was PUSH HIM DEEPER and DEEPER into Emotional Mind…and farther and farther away from Rational Mind and Wise Mind. He couldn’t think straight. The MORE he ruminated, drank, and snorted, the MORE DEPRESSED, ANXIOUS, WORRIED, and PARANOID he became. we’ve got to be straight! The Big Picture of Pete’s Story suggests he was Big-Time in Emotional Mind. He had SOME Rational Mind going on…but, not much. He was AWARE of the consequences of losing his job, he KNEW he should not return to his ex, and he KNEW his behavior would cause family problems. He was probably 80%-20% Emotional Mind – Rational Mind. Wise Mind flickered on and encouraged him NOT to call his ex. Not having that option…and having more time to drink and snort, he panicked even more…and came to believe that suicide was his best option. and we begin to think the worst option is the best? He’ll either do something MORE DESTRUCTIVE, like a suicide attempt, driving drunk, or a full-blown relapse OR he’ll do something LIFE-ENHANCING like staying safe and sleeping it off in the car and TURNING ON Rational Mind WHEN HE COMES TO…TO GET HIS LIFE BACK IN ORDER. Pete’s story tells about the “Something That Happens” on the Recovery Path and the two choices we have. Pete CHOSE the RELAPSE ROUTE in the Heat-of-the-Moment. HOWEVER, he DOESN’T HAVE TO stay on that path. He can call for help at 3AM or crawl into his car and sleep it off. At this point, Emotional Mind will probably rear up with all kinds of self-defeating thoughts and feelings. Pete MUST TURN ON Rational Mind to Fight for his peace and stability. He cannot ALLOW Emotional Mind to control the course of his life. When a destructive thought comes up, Pete needs to remind himself that HIS NUMBER ONE PRIORITY is to STAY ON the RECOVERY PATH and that HE CAN AND WILL HANDLE this situation. He needs to tell himself that he STRUCK OUT last night, but there’s still MORE INNINGS in the game. He’ll have to challenge the destructive Emotion-Driven Thoughts AS THEY COME UP and REMAIN FOCUSED on TRUTH, REALITY, DAMAGE CONTROL, and PROBLEM-SOLVING. Wise Mind might suggest he visit his boss to apologize for blowing up and to ask for his job back. Wise Mind might suggest he TRY to assure his boss he didn’t do what he was accused of doing. Wise Mind would likely remind him if “Plan A” doesn’t work, he could apply for dozens of other jobs until he gets one…and that IT’S NO TIME TO BE PICKY! Wise Mind might encourage him to explain the situation to his parents…to let them know HE SLIPPED…but was BACK ON the RECOVERY PATH. If needed, he could tell them he’ll have a job quickly, REGARDLESS OF WHAT HE HAD TO DO. Wise Mind would likely inform him that it’s unlikely he’ll get called for a UA over the next few days and to pray on that! If he did get called for one, Wise Mind might suggest telling his probation officer what happened and the POSITIVE WAY HE’S DEALING WITH IT. Wise Mind would have MANY DAMAGE CONTROL and PROBLEM-SOLVING IDEAS for GETTING RECOVERY BACK ON TRACK! When we mess up, we don’t give up. We STAY IN the game even if it’s our toughest inning ever. Rather than spending days worrying about a catastrophe happening, Wise Mind would inform him that he’d be BETTER OFF PREVENTING ONE by focusing on a Game Plan! Wise Mind would strongly encourage him to chill-out and focus on Damage Control, problem-solving, and the use of Life-Enhancing Coping Behaviors (5) to avoid destructive worry. This WORK-UP of Pete’s story shows how RATIONAL MIND helps to CONTROL the INTENSITY and NEGATIVITY of an UPSET EMOTIONAL MIND! Rational Mind DOESN’T BUY INTO a “I’m a total screw-up. This is going to ruin everything. I can’t deal with it. I should kill myself.” mentality. Rational Mind CHALLENGES panic and negativity by looking at the situation in a calm, NON-EMOTIONAL, realistic, logical, and truthful manner. In the upcoming sections, we’ll look at some common Emotional Mind experiences from the viewpoint of Rational Mind. We’ll see how Rational Mind TAKES the POWER and NEGATIVITY OUT OF a destructive emotional experience. Rational Mind tames what comes out of Emotional Mind. of what is going Out-of-Control. 2- UA – urinalysis – a urine test to check for drugs or alcohol. 3- Probation revoked – to lose the privilege of being on probation. Folks have to serve their sentence in jail if their probation is revoked. 4- Catastrophizing – (cuh-tah-stro-fi-zing) –when we’re focusing on the very worst things that could happen. It’s a form of the word, catastrophe – (cuh-tah-stro-fee). 5- Being busy with problem-solving…and working towards the solution is a powerful coping tool. Getting a newspaper and a phone book and making a list of jobs to apply for and businesses to call and visit is solution-focused. Visiting the employment agency and ironing a decent set of clothes for job hunting is very constructive, too! Visit the DBT-CBT Workbook website for more information about this recovery program. DIRECT - from the DBT-CBT website --- U.S. and International sales. AMAZON --- U.S. and International sales. BARNES AND NOBLE --- for U.S. sales. BORDERS --- for U.S. sales. ALIBRIS --- for U.S. sales. EBAY --- for U.S. and International sales. If our loved one truly loves us, but they are abusive towards us…should we forgive them…and continue to stay with them even though they are hurting us…and emotionally destroying us? The Two Versions of the DBT-CBT “Out-of-Control” Workbook by Melanie Gordon Sheets, Ph.D.
DBT – CBT Training Workshop – Midland, Texas – June 21, 2010 ~ ~ ~ River Crest Hospital presents “From Chaos and Conflict…to Peace and Stability” – a one-day workshop with Melanie Gordon Sheets, Ph.D.